We have done B.E.M.S (Bachelor of Eastern Medicine & Surgery) from Hamdard University, Karachi. It is a 5 years Degree Course of Hamdard University. As a part of our syllabus we studied all subjects related to Modern Medical Sciences along with herbal medicine and Tibb-e-Nabwi. We had a complete course on Regimental Therapies as well. Hijama, Massage, Leech Therapy, Cauterization, Baths (Hammams), Purgation are all part of Regimental Therapies. We have chosen Hijama along with Herbal Medicines as an effective mode of treatment. We have had experience in Depressed Immune systems, Blood pressure, migraine, allergy, back pain, Arthritis, Sciatica and in Chronic disorders. 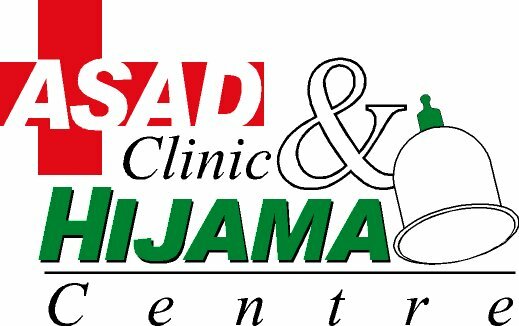 We do Hijjama in patient of low back pain, Sciatica, frozen shoulder, cervical spondylitis, hepatitis & constipation. Specially Dr. Nuzhat has remarkable experience in Female Infetility & other Gynecological problems. Migraine, Low back ache, frozen shoulder, depressed immune system, sciatica,& Gynecological problems, Infertility & Blood pressure respond well to Hijama therapy. – Do you have any interesting case studies that you can briefly share with us from your Hijama Treatments? I had an experience in Depressed Immune systems, a patient of mine is very sensitive to flu & cold in winter, even he got problems from a patient of flu from a distance. He got Hijama Therapy before winter and he came to me in spring season and told me that he found tremendous results from his last therapy as he did not get flu or fever throughout the season as Allah gave him Shifa from Hijama / Sunnah Therapy. Dr. Nuzhat treated many cases of Infertility & other gynecological disturbances by Hijama & Herbal Medicines. Prevention is Better than Cure… I always recommend people to have Hijama Therapy on the 17th, 19th & 21st of Lunar Month, even if they are not sick. By reviving the Noble Act of Sunnah, Allah will give them Baraka in health and save them from ailments. One should take Hijama session atleast in 3 months time to get regular benefits in his or her life. -As a Hijama therapist, how often do you get hijama done yourself, and what for (if any specific condition) and who do you go to to get it done (since it is not an easy therapy to self-administer)? I am used to of taking regular Hijama sessions from Dr. Nuzhat (my wife)in every 3-4 months. It not only gives me relaxation but also boosts my immunity & energy levels. – What is the overall prevalence of hijama therapy in Karachi, Pakistan? Is it available in hospitals and clinics as a valid alternative / sunnah therapy ? Not yet, but people are asking about it. We are practicing Hijama and giving training as well. Doctors, Hakims, Homeopaths are doing Hijama therapy in their private clinics but at Hospital level it is not seen yet. A-G-3, Farhan Heaven, Gulistan-e-Johar Block 17 near Johar Chowrangi, Karachi, Pakistan. -Is there anything else you would like to add? Of course, first I thanked Allah subhan-o-wata’ala, who gave us such knowledge which is beneficial for the mankind and gave us opportunity to spread it in our nation and muslim ummah. Second, I really appreciate your work and dedication towards spreading and maintain this noble cause of reviving the forgotten act of Sunnah. May Allah gives His blessings on you & reward you in this world and in the Aakhirat. Aameen. Assalaam –o-alaikum & JazakAllah bil Khair. Our thanks to Al Asad Clinic & Hijama Centre from Karachi, Pakistan for sharing the above post. If you have any questions or comments or want to leave a them a testimonial, then please do so via a comment* below. Nice to know that Hamdard's Graduates are practicing Hijama with Herbal Treatment. We must follow the path of Sunnah plus medications to attain optimum health. I appreciate that you people have started a clinic for such a noble cause. I congratulate both of you for this. May Allah advance you further in this work, and that you may succeed in the future. Ameen.